(Nanowerk News) The search for a mysterious subatomic particle can certainly involve some enormous tools, not to mention a multitude of scientists. 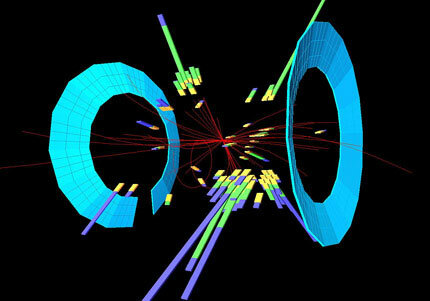 The effort to find the elusive "Higgs boson" includes over 5,800 scientists from 56 countries! It's a subatomic particle that gives other particles, such as quarks and electrons, their mass. With support from the National Science Foundation (NSF), physicists Michael Tuts at Columbia University and Kyle Cranmer at New York University are among the 21st century explorers who have been on the hunt for the Higgs. "There is an important and fundamental synergy that's not to be missed in challenging the deepest scientific questions of our time, while simultaneously educating new generations of scientists and engineers, and developing technologies that can advance society and propel the world's economy in the future," says Saul Gonzalez, program director for Experimental Elementary Particle Physics, within NSF's Directorate for Mathematical and Physical Sciences. Without the Higgs, atoms could not form. "The universe would be a fundamentally different place. There would be no life, no stars," says Cranmer. The Higgs boson is a central component of the "Standard Model," a theory that defines the relationships between the forces of the universe. But, what if the Higgs boson is not a fundamental particle, but rather a bound state of new particles that have not yet been seen? Scientists who advocate alternative models of particle physics are motivated by the theory of superconductivity. The superconducting state, which is very different from ordinary matter, is not characterized by new particles, but by Cooper pairs--bound states of electrons. The Standard Model of particle physics suggests that the protons and neutrons we're familiar with, that comprise the nuclei of atoms, are made up of combinations of different types of elementary particles called quarks and gluons. We cannot see these particles in isolation because a fundamental force called "the strong interaction" holds them firmly together, but experiments lead physicists to believe these quarks come in three varieties, each with different properties, or "colors." Cranmer's and Tuts' detective work is done at CERN, the European Organization for Nuclear Research, located in Geneva, Switzerland, where construction of the Large Hadron Collider and the detectors needed to study these particles took years to complete. Cranmer first visited CERN as a graduate student. "When I was at CERN, I would watch these pieces of equipment going across the road and it was like a science fiction film, with these enormous magnets that just don't look like they're plausible, being driven across the road to ultimately be lowered by cranes into place," he recalls. "And, to have all of these millions of components put together by physicists, and have it work, is pretty surprising sometimes, but we pulled it off." And, as complex as huge magnets, super cold temperatures, and protons moving at nearly the speed of light can be, Tuts says the search for the Higgs has captured the imagination of non-scientists as well. He recalls that, a few years ago, during his plane trips to Switzerland, he'd get blank stares when he told people what he was working on. But, Tuts says, now, just as often, he will get an enthusiastic query, 'Oh, the God particle, how's that going?' from other travelers. "Historically, we know that fundamental research is the engine that drives technology," says Tuts. "I can't assure you that discovering a Higgs particle will help you tomorrow, or make your life better tomorrow, but in 10 years, 20 years, maybe 50 years, the fundamental research that we're doing now is going to be the technology of the future." That, adds Tuts, is how science has worked throughout history. "You could go back to the time of Michael Faraday, who did experiments on electricity. And, people said, 'Well that's cute, that's interesting, but so what?' Well, could you imagine our life without electricity? It's so fundamental to us. I think, in the future, we'll see that," adds Tuts. The particle detectors used to identify the Higgs boson are the size of a six-story building, full of hundreds of millions of electronic instruments. The ATLAS detector, used by Tuts and Cranmer, works like a huge digital camera. It records hundreds of billions of protons colliding at nearly the speed of light. This "camera" takes 40 million pictures per second. "We go from 40 million to about 400 images per second, saved for further analysis, and the trick is to make sure that you don't throw away the good stuff," explains Tuts. Still, thousands of computers, some at New York's Brookhaven National Lab, filter those remaining images, looking for traces of the Higgs boson, which decays quickly. Over the past three decades or more, physicists have developed their experimental and theoretical understanding of the world of subatomic particles into a comprehensive theory known as the Standard Model. Much of the Standard Model has been verified and tested. The Higgs boson is a crucial element in the electroweak part of the Standard Model, which provides a unified theoretical account of the electromagnetic interaction and the weak nuclear interaction (involved in radioactive beta decay, among other things). The W and Z bosons, also predicted by electroweak unification, were found more than 25 years ago, but final confirmation of this part of the Standard Model must wait for conclusive detection of the Higgs boson. "It only lasts for less than a billionth of a billionth of a second, so we never see the Higgs itself. We only see the things it decays into, and we only have this sort of indirect evidence at first. We have to go through and try to work out what happened," explains Cranmer. "People have likened it to taking two Swiss clocks and smashing them together, and looking at the gears flying out, trying to figure out what was going on inside!" 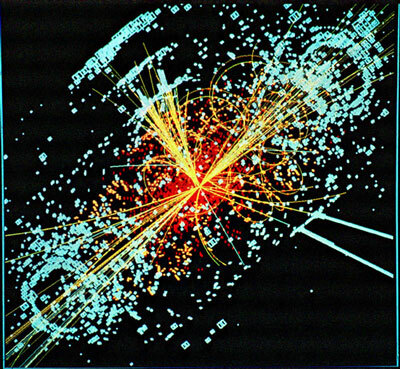 On July 4, 2012, CERN's Director General Rolf Dieter-Heuer cautiously announced the discovery of a new particle, with all the proper characteristics of a Higgs boson. "They had finally collected enough data that they could actually, definitively say, "We've seen something, and that something looks like a Higgs boson," says Tuts. "And so what I hope we're doing is actually inspiring the next set of kids who are maybe now in high school, or maybe even younger, to say, 'Wow, I can ask the question--where do we come from? Where are we going,'" adds Tuts. "We desperately, in our society, need more people who are involved and interested in science and technology."